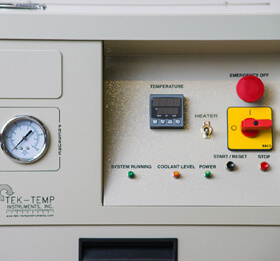 With its unique modular construction, the TKD-200 Chillers offer an extensive selection of control, monitoring, alarm, communication, and interlock options. In addition, extended temperature range equipment, and all-stainless steel and polymeric circulation systems are available. 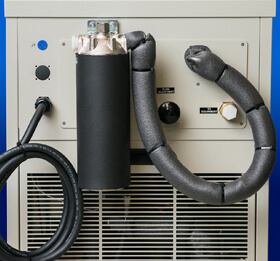 TKD-200 Air Cooled Chillers feature CFC-free refrigeration systems with compressor hot discharge gas bypass. Stability to ±0.5°C is maintained with our standard temperature controller with digital display of process/setpoint temperature. If still tighter stability is required, these chillers can be equipped with our microprocessor-based temperature controller that is stable to ±0.1°C. All TKD-200 Air Cooled Series systems come standard with a coolant pressure gauge and a coolant level switch. Also standard is a flow/pressure adjustment value (these features are often optional with other manufacturers). 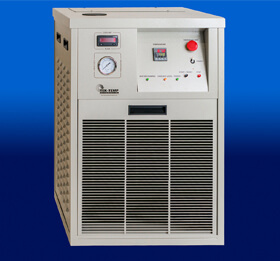 The TKD-200 Series Chillers are ideal for both OEM and end user applications. PUMP OPTIONS: See pump curves to pick the pump you need.